The Independent Drama Society will celebrate the end of its third season with "The Good Doctor," directed by the company's Marketing Director, Christine Toohey. The comedy by Neil Simon, inspired by the short stories of Anton Chekhov, will run from July 15 -23 at the Factory Theatre, located at 791 Tremont Street in Boston's South End. Celebrating life's ups and downs, "The Good Doctor" offers a series of poignant, touching and funny vignettes drawing inspiration from such varied characters as a suave seducer of other men's wives, a determined young actress and a hapless government clerk. The cast features Chris Anton, Kate Daly, Melissa deJesus, Zach Eisenstat, Mark Estano, Sarah J. Gazdowicz, Sierra Kagen, Chris Larson, Bob Mussett, David N. Rogers, Victoria Townsend, and Brian Tuttle. Christine Toohey commented, "This play has a little of everything. It's a Neil Simon comedy, first and foremost . . . but the production will also take the time to explore the individual, everyday tragedies of human life that captured Chekhov's interest. We'll engage our audience's intellect as well as their sense of humor, and they'll leave chuckling even as they ponder the play's themes." 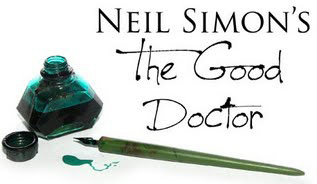 Neil Simon is a Tony and Pulitzer Prize-winner. His plays include "Lost in Yonkers," "Sweet Charity," "The Star-Spangled Girl," "The Odd Couple," "Barefoot in the Park," "God's Favorite," Broadway Bound," and "The Goodbye Girl." Simon has also written more than twenty screenplays including "The Out-of-Towners," "Murder by Death" and "The Goodbye Girl." Christine Toohey is a founding member of the Independent Drama Society as well as the company's Director of Marketing. Her directing credits for IDS include "Minutes Remaining" (Fringe Wars submission) and "Nouveau Normal " (SLAMBoston). She has appeared onstage in "And Then There Were None" and "The Illusion," "Gorefest VII: The Worster Seed," and "She Loves Me." She is currently a cast member of ImprovBoston's Family Show and the Management Associate at New Repertory Theatre.